One thing lot of people in my photography world do not know about me is that I love babies. I grew up with a mother who ran a preschool out of my basement. She was an entrepreneur, as well as a teacher and early literacy specialist. I would come home from high-school to snuggle babies and be around little kids, so it is always a treat to photograph babies! I really enjoy documenting the new relationships a baby brings to a family and capturing the sweetness in this chapter of life. 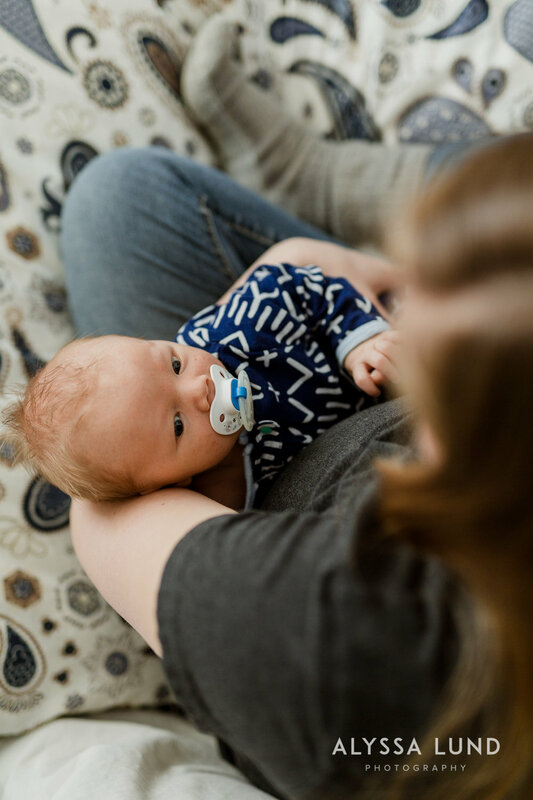 When approaching a newborn session, everything is on baby time and very different than the pre-planned structure and fast-moving timeline of a wedding day. It is a really slow, calm, and relaxing process that generally lasts about four hours. When I arrive, we do not need to start taking pictures right away, I often help people choose outfits and feel ready for the session. Before I start taking photos, baby usually gets fed so that they are all warm and sleepy. Anytime during the session when baby gets fussy and needs a diaper change, food, or a break; we just pause and do that. 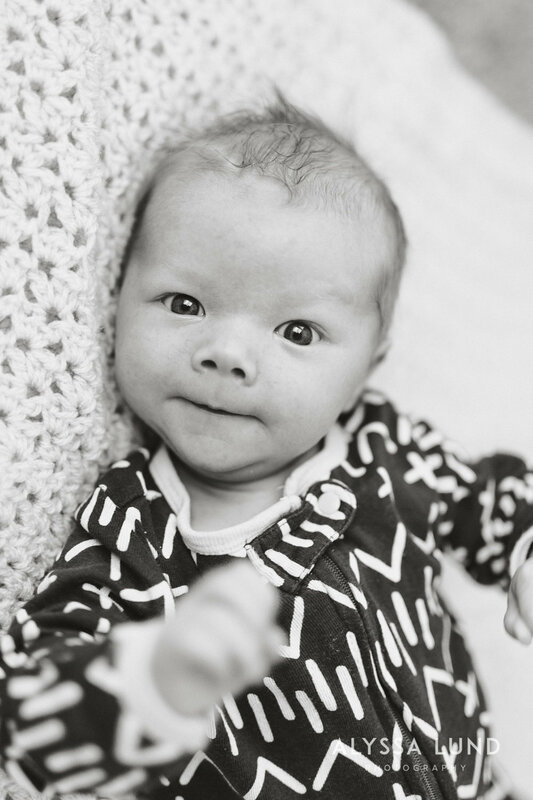 Typically I do newborn sessions in the family’s home, although I have done them in my studio, too. 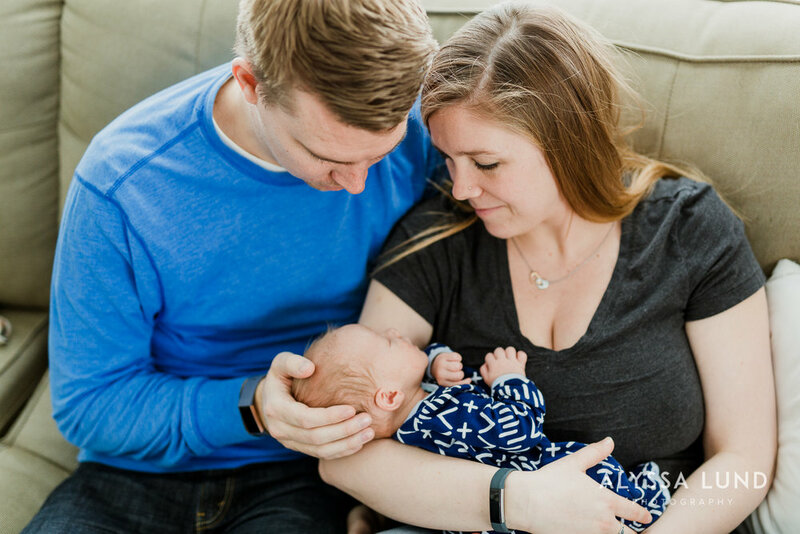 Shortly before Reece was born, I connected with Charlotte and Marty and they decided my lifestyle inspired newborn portrait style was a good fit for capturing this new chapter of life for them. I photographed their happy and relaxed summer wedding in Kansas a couple years back, and it is the best compliment I can receive when a couple wants to work with me again after their wedding day. Charlotte and Marty were very intentional about when we scheduled these portraits. 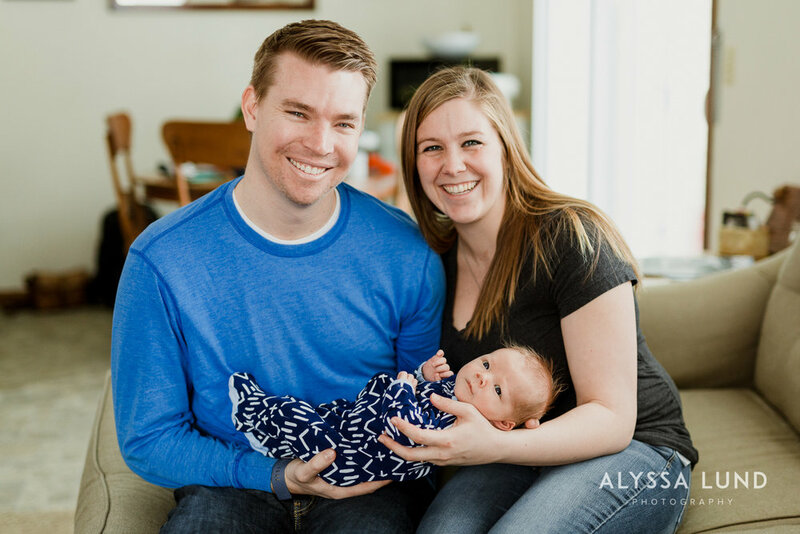 While most of my newborn sessions happen within the first week or two of the new baby’s life, they chose to have their session when Reece was about a month old so that he would interact more in photos and have his sweet blue eyes open. They really wanted to focus on their interaction with him, and the timing felt very right for them! On the day of their session I got to Charlotte and Marty’s home and we chatted for a little bit as they showed me around their house. We talked about where they wanted to do their photos, and I took note of the light in each space. They had lots of windows and beautiful light in their space and we settled on the living room, bedroom, and nursery for their portraits. We paused and Charlotte fed Reece, and then we began taking some portraits! Reese was pretty sleepy the first half of the session and opened his eyes for the second half just as his parents had hoped. As we moved into their different rooms and spaces, we got a relaxed mix of photos— I took portraits of Reece, Reece with each of his parents, and all together as a family of three. Their dog, Spuds, also made an appearance! Charlotte and Marty expressed to me that their bed has been the place they have all been spending a lot of time. 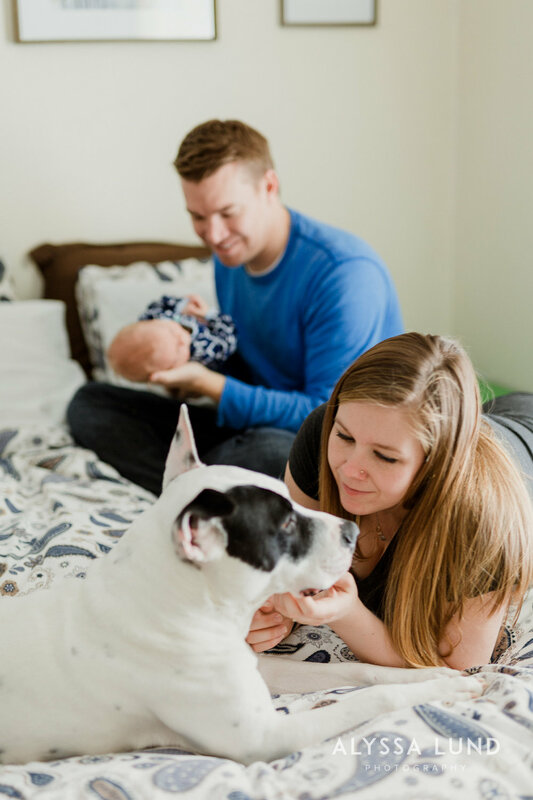 It has been the center of their home as they love on and snuggle with their new baby and each other as a family (Pssst: check out the wedding photo art above their bed!). They incorporated a few very meaningful pieces into their pictures: an heirloom rocking chair and two special blankets from a great-grandmother. I adore these portraits and the way it feels like we were all just hanging out together, truly a time capsule for this family! Charlotte and Marty, thank you for welcoming me into your new home in Minnesota. 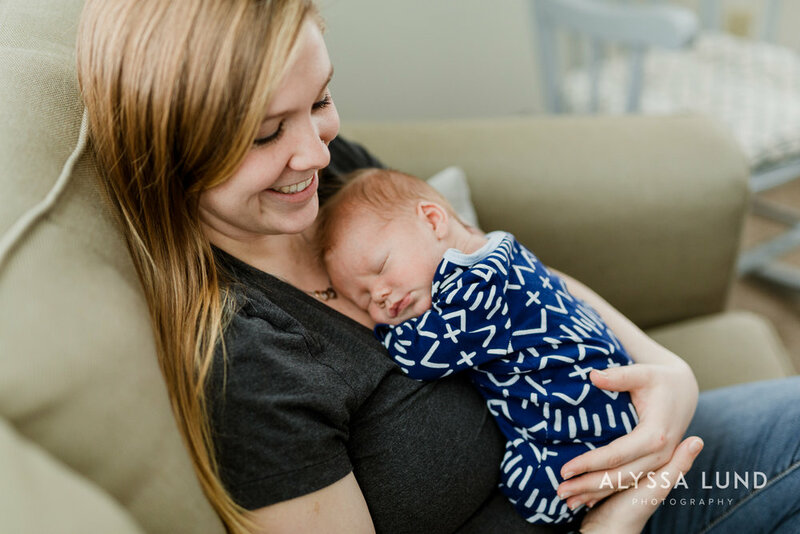 I loved meeting little Reece, getting a glimpse into your life as a new family, and I’m still cherishing the baby and dog snuggles from this day!